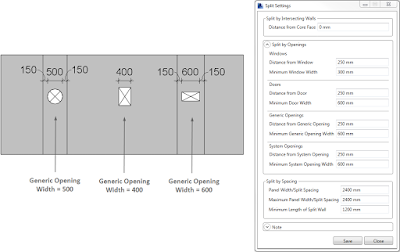 Revit Add-Ons: New Smart Walls Versions Released – Automate Wall Splitting in Revit! 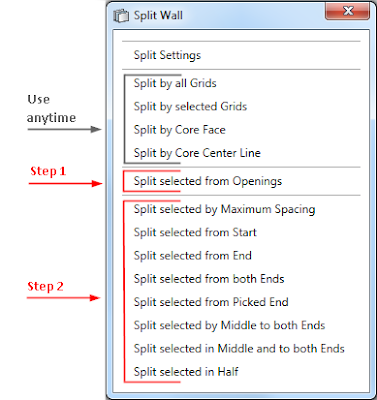 New Smart Walls Versions Released – Automate Wall Splitting in Revit! Moreover, now you can predefine Minimum Width for Window, Door, Generic Openings and System Openings in "Split Settings". Function “Split from Openings” will ignore openings which width is less than 500mm, if Minimum Openings’ Width is less than 500mm, they will have no impact on the splitting layout. Functions that are listed below “Split from Openings” (“Split selected by Maximum Spacing”, “Split selected from Start”, etc.) will split according to predefined settings in “Split Settings” dialog window, andopenings will have no impact on the split layout. So if a split will overlap with an opening which width is less than minimal, the tool will split directly through them (does not apply to System Openings). Note: After initiating splitting, it may be determined that one or more gaps overlap with families’ insertion point(s), therefore such families would no longer have a wall as their host. In this case, you will be asked to change your configuration in Split Settings or move such openings, so they have a host (wall) after splitting. Separate functions “Split selected from Windows”, “Split selected from Doors” and “Split selected from Windows and Doors” were replaced with function “Split by Openings”, which splits selected Walls from inserted Window, Door, Generic Openings’ and System Openings’ sides according to predefined configuration. Distances of splits from Openings and Minimum Openings’ Width are configured in Split Settings. 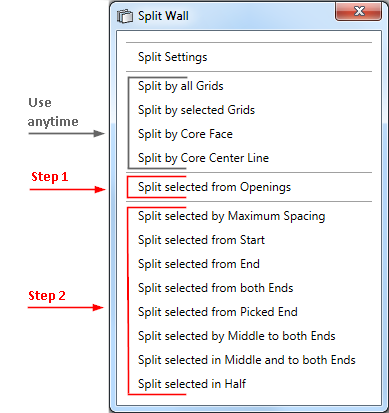 User should start off by splitting walls by openings using “Split by Openings” function, and then continue by splitting them using other functions that are listed below in the Split Wall dialog window. You can use functions that are above “Split by Openings” at any time. 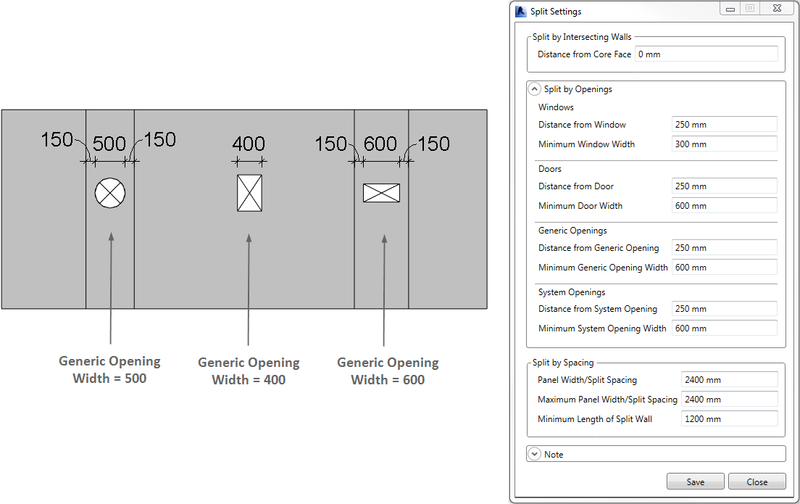 Step 1 - walls are “Split by Openings” that exceed Minimum Width, which is configured in the “Split Settings” dialog. Go ahead and try this enhanced Smart Walls tool for Revit! Smart Walls is brought to you by AGACAD. Pricing starts at $199.00 / year. There's more information available on the AGACAD blog.